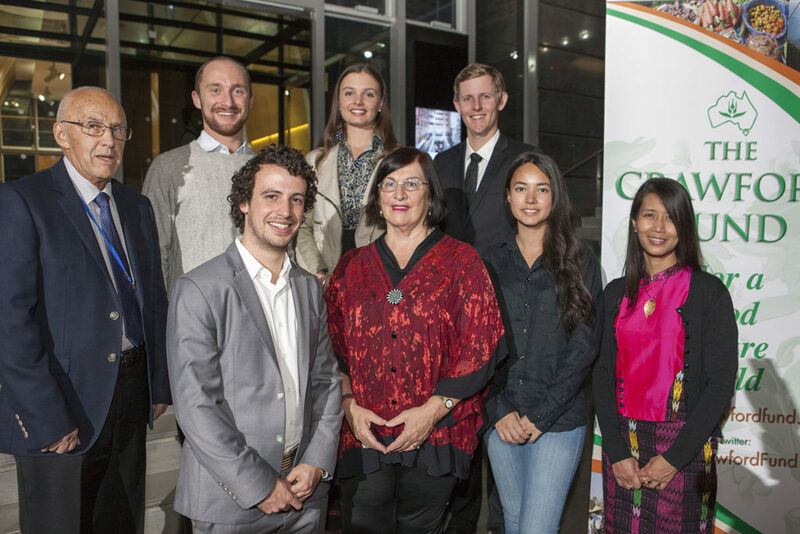 Eight NSW scholars were sponsored to attend the 2016 Crawford Fund conference this year. Five scholars were proudly sponsored by the NSW Crawford Fund State Committee. In addition, we are pleased to have had two scholars sponsored by the Graham Centre for Agricultural Innovation, Charles Sturt University, and a scholar sponsored by the University of New England. This year, I was lucky enough to be selected as a scholar for the 2016 Crawford Conference: Waste Not, Want Not: The Circular Economy to Food Security. On 29th – 31st of August I joined scholars from all over Australia for an introduction to international agricultural research in Australia and to learn how, as students, we are able to make a contribution to food security and sustainability around the world. The key message of the conference was that from paddock to plate, from farm to fork there are changes that each of us can make to lower our food wastage, increase our production efficiencies which will contribute to food security in 2050. As was highlighted by Dr Brian Lipinski and Dr Karen Brooks, share of losses from each area of the supply chain (production, handling & storage, processing, distribution & marketing, consumption) differed dependant on what part of the world was being measured; developing countries tended to experience greater loss during production and storage, whereas developed countries experience greater loss during consumption. This was highlighted from a different angle by each speaker. Simon Costa demonstrated some of the tangible problems that can be solved in the production chain in developing countries. After spending time volunteering with the United Nations, Simon recognised that many of the economic problems faced by the families in the communities he worked with stemmed from their lack of appropriate storage. After identifying that problem, Mr Costa took it upon himself to design a discounted silo operation, to make modern silos more affordable for families in Uganda and Burkina Faso. The storage life of the grains was extended as a result so that instead of needing to sell the grain immediately (flooding the market and driving prices down), families with silos could store the grain and wait for a better price, without risking quality losses. From this I took that as an individual, changes can be made in our homes and in our communities to reduce food wastage that will make a tangible difference to food lost. In Australia, we can engage with charity organisations such as OzHarvest, to ensure excess food at the retail and consumption end of the supply chain is utilised; or shopping with a list to limit impulse buys and food spoiling in the fridge. These are all small measures to take, and easy to implement by families, but on a large scale, will considerably reduce our impact. Other technology options for increased food security were explored during the conference as well. Development of toilet design to harvest human excreta for phosphorous fertiliser crops was discussed by Dr Dana Cordell; Plantwise is an extension program developed in Africa to enable farmers to identify disease in their crops and appropriate control measures, discussed by Dr Washington Otieno; fermentation of wastes results in biogas that can be recycled and used for cooking and lighting, as discussed by Bernadette McCabe; even Computer Printable Food was on the agenda, though Dr Stephen Lapidge was met with incredulous looks from the conference attendees after he mentioned it! The development of these technologies is the basis for the name of the conference, ‘A Circular Economy.’ These technologies allow resources to be recirculated through the system and reduce wastage. The mentor program was, in my opinion, one of the more unique and worthwhile parts of the conference, and definitely beneficial to the students involved. Networking with established professionals can be a daunting process for university students at any stage, and the mentors went to a huge effort to find out their charges’ interests, so they could facilitate meetings with interesting and involved conference attendees. Meetings with students from around Australia was also hugely beneficial as we discussed our various research interests and found common ground. I was lucky enough to be partnered with Neil Inall and his lovely wife Annie as mentors. As we listened to each speaker at the conference, Neil stretched my perceptions of the topics covered by asking me to consider each from a different direction than I normally would, and therefore I gained much more insight than I otherwise might have. Finally, I will leave you with a quote from Professor Louise Fresco from Waginengen University in the Netherlands. Professor Fresco was the keynote speaker at the Networking Dinner on the 29th of August, and her key message resounded with students, academics and industry professionals alike. To be successful in agriculture, particularly in the field of sustainability and food security, one must be a ‘Jack of all Trades, and a Master of One’. This is an important message that is sometimes overlooked as we get focused on our one area of study, and forget to consider the system as a whole. Agriculture is a dynamic, interlinked network. While it is vitally important to be a specialist in one area so you can give the most up-to-date advice in your research area, having an understanding of how your research fits into the wider system increases its relevance and practicality, as the end goal of international agricultural research is to develop technologies and methods to increase efficiencies on farm and in the supply chain. This point was supported by David McGill on Wednesday, August 31st when he described some of his early work in dairy extension. After arriving in Pakistan, he remembers how he ‘identified the root of the problem’ of reduced milk production immediately. ‘Why, to solve their milk production problems, all we have to do is to tell them to give their animals free access to water and grazing instead of leaving them tied to posts. We will be finished this project in six months!’ (Paraphrased for the purpose of explanation). Needless to say, the project was not finished in six months, and in some areas it took three years before the local extension officers McGill’s team were training understood the reasons behind using the new methodology, and the improvements it could mean for their dairy industry. As agricultural researchers, we need to utilise our skills in communication and cultural literacy, to implement supply chain efficiency and improved production processes that fit within the community we are working in. To conclude, the Crawford Conference was an absolutely fantastic experience. As an Agriculture/ Business student at UNE, I have always been interested in food security, welfare and international agriculture, and have taken up every opportunity I could find to get involved in those types of programs. The Crawford Conference was the first program I have been to that gave us a tangible network we could access to be involved in international agriculture, and steps we could take as students to move toward that career path. Congratulations and thank you to the RAID Network, ACIAR and the Crawford Conference Committees for ensuring we had such a worthwhile experience. I applied to be a scholar at the 2016 ‘Waste Not, Want Not’ conference because I was passionate about the topic of food waste, an issue I saw as ‘low-hanging fruit’ in terms of our ability to eliminate it. But not only did I learn more about the issue of food waste, which actually should be termed ‘food waste and food loss’, I also came away with an impassioned zeal to spread the word about food and agriculture more broadly. Tackling food waste and loss from a variety of angles, the speakers at the conference provided a wealth of insight and plenty of note-taking on the issue at hand. Karen Brooks probably provided me with the most startlingly of insights when she iterated the fact that data from IFPRI research showed that there isn’t a strong correlation between reductions in food waste and loss, and reductions in hunger. This really challenged my point of view, as this was an opinion I held prior to the conference and really felt epitomised the debate around food waste and loss. As she explained it is the issue of access that underlies and limits the full potential of reduced food waste and loss, an issue that I had not considered until then. The ripple effect of an issue is never isolated, with issues such as globalisation, technology utilisation and nutrient recycling also been brought into the fore by various speakers. An issue is never black and white, rather there are many shades of grey, with each speaker at the conference contributing to the grey area, making things apparent and bringing them to the fore. And although there was a risk of being overwhelmed by the problem and the many grey issues being discussed in regards to the ‘low-hanging fruit’, what really uplifted me and put things into perspective was the other delegates, particularly the other scholars. It was incredible to meet with other like-minded individuals and share the work we were doing in the area of food and agriculture. We came from different career backgrounds or areas of study, yet we had all been along the same journey of discovering the importance of food; a three-times-a-day act that most people take for granted. It also gave me a fire to see so many young people taking up the challenge, being innovators in their field, to make a difference to our world. Harking back to the inspiring quote by Professor Fresco at the first scholar’s day, “We need to tell the story of food and agriculture in a compelling way “; I felt this really encapsulated the conference experience for myself. It has inspired me to consider how we encourage consumers to ask for the stories from food and agriculture, but also how to equip people to tell those stories in a compelling manner. Gaining the correct experience that will help you develop your career in sustainable agriculture requires dedication, knowledge and sometimes volunteering, but above all else, a group of colleagues and mentors from a variety of different disciplines and sectors is crucial to growing as a researcher and scientist. The Crawford Fund conference illustrated what you can achieve with these characteristics—significant and positive changes. For me, studying sustainability often meant dealing with the stress of getting a job once my studies were complete. But there are things you can do to improve your chances and overcome the stressful but extremely rewarding career path. The speakers at both the scholar days and the Crawford Fund conference reinforced my beliefs that you can overcome the academic, workplace and internal challenges associated with working in an area you love. The conference highlighted that people from many different sectors have achieved their goals in working toward sustainable agriculture. From Madaline Healey operating in a very difficult work environment in Laos, to Professor Louise Fresco’s broad efforts to improve the degrading relationship humanity has with food. They all had their own barriers to overcome and it was inspiring to hear about their success stories and future ideas about sustainable food. The Crawford Scholar days and conference provided every one with a fantastic opportunity to learn about some current efforts by Australian scientists to improve the sustainability of agriculture systems. For me, working on food waste at the retail and consumer stages of the value chain, I learnt a lot about the upstream efforts by Australian researchers in developing countries to reduce on farm food loss and increase agricultural productivity. The conference’s mentor/scholar program was a great idea and one I hope the conference continues. My mentor provided excellent advice about developing a strategy to achieve my future career goals and was also happy to stay in contact and provide further advice. However, the highlight for me was networking with the other scholars and mentors. These networking discussions were fantastic since they not only allowed me to promote my own research but also facilitated in-depth discussion about possible next steps for my project, as well as allowing me to contribute to other researchers’ ideas. Many of these discussions have continued after the conference and I hope will facilitate further collaboration to improve the sustainability of agricultural systems. The Crawford Fund conference provided an excellent opportunity for attendees to gain a broader picture of food loss and waste research in developing countries and promoted collaboration through multiple networking sessions which will be invaluable in the future. The importance of volunteering overseas is something I know first-hand broadens the mind, provides invaluable experience and helps you focus your research and future career goals. The Crawford Fund conference provided an opportunity to discuss food waste and a circular economy to food security in an engaging and educational environment, while promoting collaboration between various stakeholders. I look forward to hopefully being a part of the Crawford Fund conference next year. Attendance at the Crawford fund conference largely revived my faith in international agricultural research and allowed me to harvest more inspiration, wisdom and knowledge – three key ingredients needed to survive the daily grind of a PhD. One of the many highlights for me was the presentations by Louise Fresco. To me, her several talks reiterated the point that despite the multiple coinciding environmental and population crises challenging future food security, international agricultural research and development will be the most valuable tool to find solutions. This will require collaborative innovation from the key stakeholders of the circular economy of food. The answer to overcoming resistance from consumers, farmers, researchers, governments and the public sector to communicate, will be the ability of each to ‘tell their story’. Especially relevant to livestock researchers was her acknowledgement that livestock can utilise land unsuitable for crop production to produce nutritionally diverse, high quality food – a critical component to future food security. How we will innovate from pre- and post-slaughter/harvest stage to reduce food loss will be a major objective for both livestock and the cropping industry. How we perceive our food tends to indoctrinate how we value or waste food on the consumer end. The reduced perception of safety, the over-affordability and displaced knowledge of agricultural products play a major role. Hence, re-engagement of urban consumers with the ‘story of food’ is needed. I benefited from many speakers, namely Dr Washington Otieno and Ashok Gulati, who presented innovative tools such as ‘Plantwise’ – an electronic survey allowing smallholders to photograph plant diseases and receive pathological diagnosis and advice from scientist on the other side of the world. Mr Gulati’s novel ‘uber-tractors’ was a meaningful anecdote on overcapitalisation and the need for innovative aggregation to enable involvement of smallholders with technology despite capital investment often being constraining. Simon Costa was also beneficial in reiterating the importance of research implementation, particularly in food storage and logistics, making note that private sector collaboration is needed to manufacture technology such as silos for grain storage. How will this benefit my research in improving reproductive efficiency of cattle and buffalo in Cambodia and Laos? These sessions provoked me to think about how we can convey our research better to smallholders to gain wider adoption and scaling-out of benefits. This will surely involve the upgrade to electronic survey technology to enable the University of Sydney, Department of Livestock and Fisheries (Laos) and Department of Animal Health and Production (Cambodia) teams to capture real-time data and access tools such as photos and coordinates which may improve how we teach farmers how to recognise aborted foetuses or how we track animal and disease movement. Developing livestock productivity will be essential to future regional food security. The “Waste Not, Want Not: The circular economy to food security” conference was held on the 29-30 August 2016 in Canberra. I was fortunate enough to gain a scholarship to this conference from the Crawford Fund to attend. This conference was incredibly insightful, touching on topics that considered food waste and food loss inside and outside of Australia. I was excited to expand my knowledge on such an important topic that impacts the global food security. I believe that I benefited from the conference immensely; as an emerging food security leader, to understand the landscape of food loss and waste is essential. In my intended future food security career endeavours, I will be sure to consider post-harvest food loss as a crucial consideration for intervention. For example, I have previously been involved in a project in Cambodia that solely focused on increasing agricultural production, however I will be sure to offer my advice on this project in considering the food loss that their agricultural practices may be incurring and consider innovative solutions to reduce this. The highlight for me during these few days in Canberra was being paired with my very inspiring mentor, Lester Burgess, who is incredibly experienced and knowledgeable, as well as a genuine and kind individual. Although his experience is more within the agricultural science area, this is an area in which I wish to become more knowledgeable and he was able to recommend some interesting AVID opportunities. It is a relationship that I am excited to continue and I am confident that it will be mutually beneficial when Lester may be in need of some nutrition specific information for one of his projects. It was also a highlight to connect with the other young, passionate individuals who attended this conference and are involved in this food security space. I am confident that I will be leveraging many of these connections made in future projects of mine and I am excited to one day work side by side with many of the people that I met. My favourite presentation was the one by Simon Costa and his work with the World Food Programme. His passion and pragmatic approach to food security concerns in vulnerable communities in Africa were incredibly inspiring. I enjoyed viewing this issue from the scope of a business orientated person from a different industry who was able to have much success on this issue. I would like to thank the Crawford Fund and Cathy Reade for giving me the opportunity to attend this incredible conference. It was very informative and I would be quick to recommend this event to anyone else that is passionate about agriculture for development. The conference initially meant to me a platform for networking with people in Australia working in various fields of agriculture locally and internationally. Coming from Fiji, an island that receives funding from the Australian Government, I was also keen to see from the perspective of the funding and/or volunteer bodies. However, the conference was more than I had expected as it fulfilled my aims of meeting people in my field of research and understanding Australian contributions to international research. I was fortunate enough to have my state leader Mrs. Deidree as my mentor and she was quite exceptional in introducing me to all the key personalities in my area of research such as Tony Fisher but also other icons of the Crawford Fund, ACIAR , SCOPE Global, AVID and other organisations. The atmosphere of the conference was very relaxed and encouraging in terms of professionals and experienced people being more willing and approachable to talk to by those inexperienced students and learners. This difficulty of communication is the biggest hurdle that most students face in their early careers; I personally feel that I may not be competent enough to have such discussions. Hence, the conference design and atmosphere were confidence boosting and it gave me a lot of experience in approaching and talking to field experts. Apart from the networking, I also gained a lot from the presentations that were featured such as that of Dr. Louise Fresco, Sam Cook, Mr. Agarwal and Mr. Wastington. These talks were motivating, informative, inquisitive and questioning. Furthermore, the RAID network event and scholar day provided something I felt that traditional conferences lack. Hence, it is great to have those small discussion groups and talks on personal experiences. The conference really helped me to tap into the RAID network, which is a great platform for early career researchers to access information, people and opportunities. The post-RAID event was also a great opportunity to relax and mingle with people doing the same things as me, with similar interests and struggles. Finally, the question of how and where do I start my network? I believe that the Crawford Fund conference has answered these questions for me, for which I count myself very fortunate. In the meantime, it broadened my understanding of the aims of organisations such as ACIAR, in their goals of international research. By involving RAID, SCOPE Global and AVID, the conference has shown me avenues of translating my work and research interests from the local to the global stage. The 2016 Crawford Fund Conference presented proactive talks in the realm of food security and Research for Development (R4D). At the conclusion of the conference and scholar days, I had a renewed perception on my PhD project. Returning to my office with increased energy and enthusiasm to work in R4D. The conference arrangement provided a scientific basis, followed by case studies and applications in the field, an intensive day of current research and extension activities. This link of precursory science to its development and application is something that I have not experienced in other attended conferences. The structure enforced the importance of looking at R4D as a whole system. The topic of policy was lightly discussed, entwined with case studies and presentations. This was my first real introduction to the effects of policy around food security; I found it extremely interesting and will endeavour to learn more on the subject. For me, one of the standout presentations was delivered by Simon Costa. The underlying message of “taking the research we have, getting on the ground and making change” was inspirational. Costa’s deployed extension program and its successes drove the message home strongly. Of equal influence, the scholar programme and its focus on networking and early career researchers was excellent. Talks from Louise Fresco and Andrew Campbell describing their journey in science, food security, and R4D reassured me that the current uncertainty I am feeling is perfect normal and that I should strive to become the master of an area I have a great passion for. RAID’s additions to the scholar programme were well received. One of the best activities was the feedback and discussion groups, where scholars were paired with people in the industry. Questions and discussion relating to careers in R4D gave me confidence that everyone goes through the unknowns of establishing a career, and with dedication others have come out the other side. One of the biggest take home messages for me was the magnitude of academics working in areas of R4D and food security. Their passion and knowledge in these areas was exuded in every talk and case study. My workplace is often dominated by agricultural research focused on developed, local industries. Knowing you are not alone in an endeavour to work in R4D is something I appreciated. The scholar days also contributed to this. Knowing there are a number of early career researchers experiencing the same limitations, difficulties, and uncertainties as me assures me that I am not alone. Additionally, since the conclusion of the conference, my twitter feed has increased in depth of content thanks to the Crawford Fund’s twitter account and their conference hashtag “#cfconf16”. In continuing with the social media aspect of the conference, I would love to see a Twitter Q&A session set-up after each question time as throughout the day there were so many questions and so little time to answer them! It was a great honour and privilege to attend the Crawford Conference as a young scholar. To be honest, the events around the conference were pretty new for me until I was informed of this great opportunity given by my school. The theme of the Conference and the globally well-known speakers made me very excited for a couple of months prior to the Conference. It was unbelievable to meet with people in different positions and of different ages – all with the common vision of feeding the world today and into the future. Firstly, the name of Professor Louise Fresco had been familiar to me from her TED Talk before the Conference. “The Future of Our Food” address by Prof. Fresco was fantastic and drew more attention to the possible goals for the key players along the food chain in coordination with consumers, local Governments and industry. But, the support of strong policies, regulations and innovative technologies, etc. are essential to achieve the set goals. It was also worthwhile to see the keynote presentation of Dr. Karen Brooks. I do agree with her that “Food loss and waste occurs more ‘near the fork’ in rice countries while it can been seen ‘near the farm’ in other part of the world where hunger is a chronic problem. It is not easy to reduce waste without having infrastructure, innovative technology, policies, regulation, and education/awareness in the world. Food access is integral to have a balance between avoiding food waste and reducing poverty. There were many more topics that really inspired my passion for the food security issue. Secondly, I wish to express the good impression I had of the Crawford Conference; the encouraging manners from senior people to young scholars welcoming the conversation with any of them. It is an amazing practice I have learned from the Conference to bring the young generation to upgrade their knowledge and experience in both domestic and international agriculture development. In this sense, the Crawford community really do value the enthusiastic younger generation. Thirdly, the Scholar Program pre and post the Conference was great! Scholars got a chance to listen to the encouraging talks of Prof. Fresco and Mr. Andrew Campbell, CEO of ACIAR. They gave highly motivated talks to help us to start or to keep up our pace in international agriculture development activities. The Special lunch discussion with scholars and keynote speakers was also a great moment to have more discussion apart from the Conference. Finally, building a network with Researchers in Agriculture for International Development (RAID) and Crawford members is valuable for the future. The arrangement I liked most from the Conference was providing an individual mentor for each scholar. It was worthwhile not only for the Conference but for future network building in regards to common research interests. I got full support from my mentor during the Conference and beyond. Sincere thanks goes to the University of New England for funding support, and organizers and the members of the Crawford Fund for this incredible experience I gained. I will surely encourage my colleagues to attend the upcoming Conferences.